This week’s Friday Field Foto returns to what makes up the majority of my field photograph collection — turbidte outcrops. Unfortunately, I could not find the notebook that corresponds to this particular field trip and don’t have the exact XY location (someday I’ll have a camera with a GPS). But, this is a road cut along highway 16 near Cache Creek Regional Park in central California. These are Cretaceous strata that are now uplifted along the eastern flank of the Coast Ranges. Note the road at bottom of the photo for a sense of scale. As you can see this is pretty thin-bedded, fine-grained stuff — mostly siltstone with a few more resistant sandstone beds. We know they are deposits of sediment gravity flows (i.e., turbidites) but what depositional environment do you think it is? Are those marine deposites because of the Turbidites? Great question — turbidites, by themsevles, don’t indicate marine (as they are sometimes found in lakes) … but, in this case, abundant microfossils (planktonic and benthic foraminifera) and some macrofossils from all over this sedimentary basin help constrain the marine interpretation. I would guess continental slope, but have heard it could be nearer to shore than that? Silt makes me think ‘river.’ What about a river dominated delta? ah ah…! Fine-grained levees from a submarine channel along the continental slope… distal fringe downstream of turbidites lobes in a basin plain… ? these facies frepresent distal facies of turbidites. And I agree with Brian about the interpretaion of marine secdiments one should look for marine fossils. The distal basin plain environment versus submarine channel overbank/levee environment is what I was getting at … you guys are good! When I first saw these rocks they were presented to me as examples of distal basin plain — that is, very far out in the basin and only the biggest turbidity currents make it out that far. Since then, I’ve heard others say that they think these strata are up on the slope and represent the fine-grained material that is spilling out of a submarine channel. That is, they are overbank/levee deposits (what would be the equivalent of floodplain deposits in terrestrial rivers). We don’t need no steenking camera with GPS–we gots Google Earth and Street View! if yes, where are they come from? Wow, thanks for your explanation Brian. And what if i found polymict conglomerate with phyllite, lutite, tuffiite, boulder with Nummulites sp. fossil, red limestone and chert, gabbro, arenite. with clay matrix. its oligocene – miocene sedmient. this unit is overlaid some pre-tertiary rocks, they are metamorphic and pillow lava basalt. and there some tectonic process like fault on eocene and much more. I’m a bit confuse to determine it’s depositional environment, because it is mixed composition. could it be turbid that caused by eocene-fault? Without knowing anything about the geology of the location you are describing, I’d speculate that you are looking at some sort of trench-fill or accretionary wedge material (especially w/ a combination of chert and gabbro). Depending on how well-preserved it is it might be very difficult to discern the depositional environment. Are there any other beds above or below that aren’t conglomerate? The majority of deep-water conglomerate successions I’ve seen or read about are constrained by overlying and underlying deposits that show characteristics of turbidites. Some conglomeratic deposits in deep-marine settings can be debris flow deposits — that is, they aren’t turbidites in the strict sense (i.e., from a turbidity current) but from a submarine debris flow, slide, or other mass wasting process. 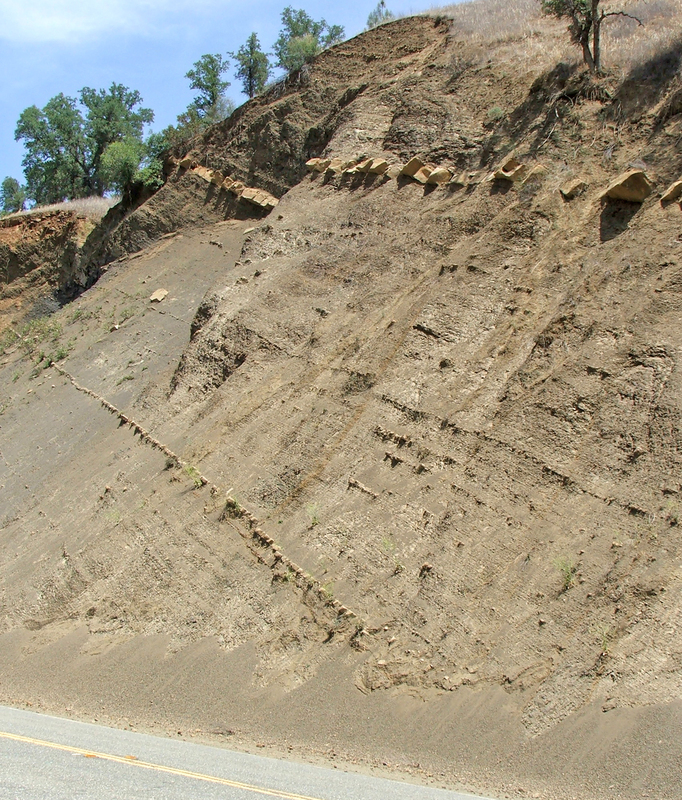 It is very common to have debris flow deposits and turbidites interbedded. Thats’s helpful Brian thank you. Actually, that formation is located in Central Java – Indonesia. There is pillow lava, gabbro and serpentine containing formation below it and there is tuffaceous marl above it.